With over 200,000 units successfully deployed, KIOSK has deep experience in a full complement of vertical markets, providing niche expertise in both platform creation and volume deployment support. OEM and end customer projects range from traditional applications in retail; bill payment, and HR to highly custom multi-function banking, vending, smart locker and border security solutions. 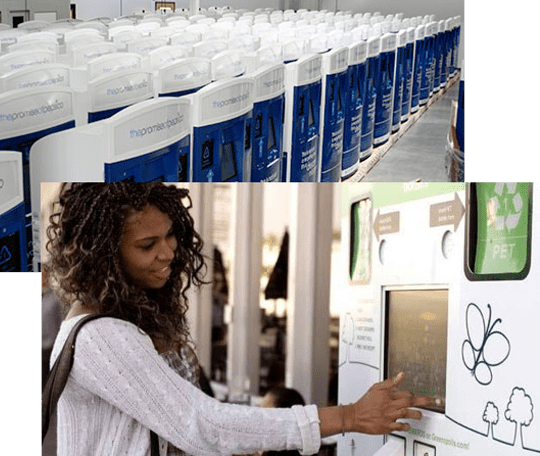 With 25+ years entirely dedicated to the art of self-service, KIOSK has the passion, expertise, and resources to greatly simplify your path to market. Frost & Sullivan firmly believes that KIOSK Information Systems has established itself as a dominant player in the interactive kiosks market as a direct consequence of its ability to bring innovative technology to its kiosks and its continuing efforts for global and vertical expansion. In 2016, KIOSK was acquired by Posiflex Technology, Inc., a global leader in POS solution design and manufacturing. In 2017, Posiflex also acquired Portwell, a global industry leader in state of the art computing solutions. 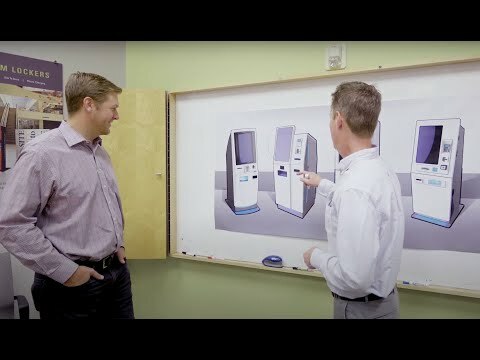 This parent – sister company relationship enables KIOSK to self-source many of the key components in our self-service solutions (e.g., all-in-one PCs, PCAP LCDs, scanners, printers, etc.). Further, this family of companies affords KIOSK clients new access to mature international manufacturing and distribution capabilities for overseas project execution. The Posiflex Group has world-class facilities in the US, Taiwan, Japan, Germany, and the Netherlands, supplemented with Sales and Distribution in 19 cities around the globe. These strategic acquisitions have provided a singular value proposition in the industry – one that we are delighted to pass on to our prospects and customers. We invite you to preview parent and sister companies’ complementary POS and computing product lines at their respective websites. This “single roof” set-up enables KIOSK to maintain the agility / responsiveness of a small company, with the execution caliber of a large corporate entity. All kiosk companies are not created equal. KIOSK is in a class by themselves when it comes to manufacturing quality, cost effective products. Theresa S. Wier, Caterpillar, Inc.
My experience with KIOSK was always positive. They are inventive, creative and built my products to a level of quality that enhanced my brand and business. Wouldn’t work with anyone else. KIOSK is the World Leader in Custom Solution Design (well >50% of production). Our team of Mechanical, Industrial, Robotic, and Software Engineers collectively provide the most sophisticated range of technical development skills available in the industry. Combining these specialized disciplines, KIOSK developed a proprietary design process (ISO9001:2015 Certified) that expertly navigates all the key considerations of a custom design experience. This continually evolving tool leverages the design nuances and experience gained in thousands of prior designs, ensuring consistent first-pass prototype success. This process tool accelerates time to market and eliminates costly rework steps. KIOSK designs from the inside-out, eliminating “one-size-fits-all” limitations. Ongoing technology investments in CAD design tools and in-house prototype manufacturing equipment enable our Engineers to anticipate and lead all key elements of custom design (aesthetics, manufacturability, field reliability, serviceability, and cost). 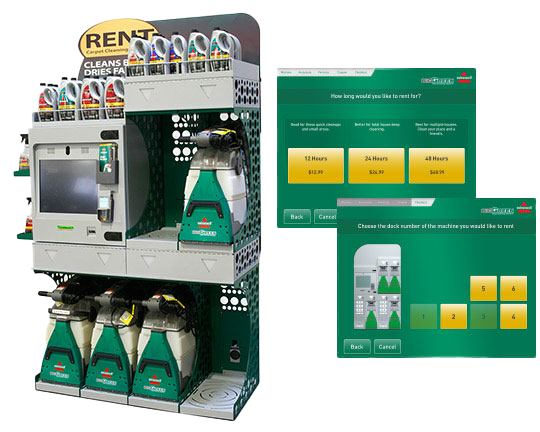 Learn much more about custom kiosks. ADA Compliance is a universal design consideration for KIOSK Information Systems. All models have been designed to comply with the most recently implemented American (ADA) and European Disability Access guidelines. These guidelines are used to ensure accommodation of all self-service customers. Certain models may require keyboard access or an ADA presentation option button on the user interface (simply lowers the transaction buttons). A KIOSK summary document of ADA design considerations is available here. 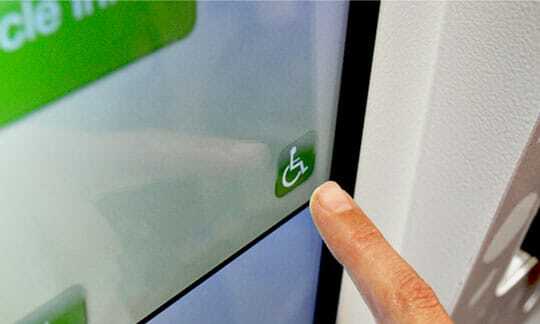 It contains overall design guidelines / considerations, as well as those for each KIOSK Standard Model: ADA Standards for Accessible Design Document. Official ADA.gov regulations document download: 2010 ADA Standards for Accessible Design. KIOSK’s expert Sales Representatives would be happy to answer any ADA clarifying questions during standard model selection, or custom solution design phases. KIOSK is committed to providing excellent design on all models to ensure accessibility for every user. In our business, safety is every bit as important as performance. We trust kiosk to deliver the highest safety standards. By definition, 24/7 uptime is the quality standard for kiosks. We recognize that quality in the field directly ties to tight QA process control in our factory. KIOSK holds ISO 9001:2015 Certification on all customer-facing processes, bringing objective evidence of the highest measures of process and quality control. Design Engineering – 70+ design check points are considered to build quality control into the kiosk design itself. Key design quality factors are methodically anticipated, rather than corrected in the field. 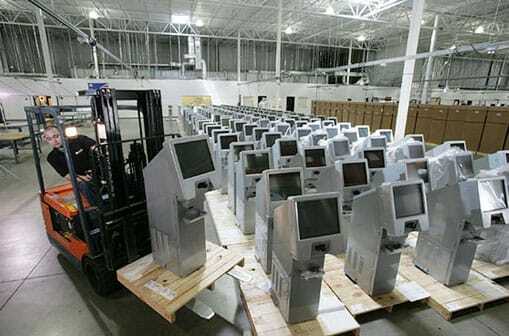 Manufacturing – before shipping, each kiosk passes dual quality checks (50 – 70 point mechanical / electrical). All production is under one roof, ensuring total process control. Field Support – all manufacturing and component records are bar-coded / serialized in the factory, providing accurate / on-demand field service records. Further, KIOSK’s facilities are ISO14000:2015 Certified, ensuring environmentally responsible manufacturing. Download KIOSK’s Environmental Policy. KIOSK provides turnkey management of UL and FCC safety agency certification procedures, enabling parallel progress to be made on certification submittals during the design and prototyping stages. KIOSK’s has a very seasoned Principal Compliance Engineer on-staff who worked for UL for 29+ years (direct experience working with KIOSK before joining our staff). This staff expertise and insight on UL certification requirements enables our team to factor optimized safety into each unit as it is designed and released. Further, KIOSK has invested in an on-site engineering lab to support in-house testing. 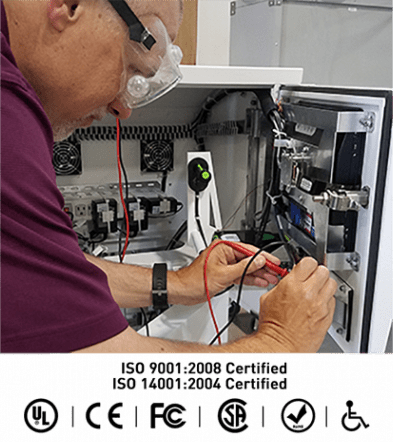 By performing the actual testing in-house KIOSK is now able to bring the final UL inspector on-site, rather than shipping units back and forth with UL. This approach can easily save four to six weeks in certification cycle time, substantially shrinking time to market release. KIOSK teams nurture initial designs through small volume proto / pilot phases required in most new projects. When the time comes, flexible “burst manufacturing” capability enables execution of steep production ramp volumes (up to hundreds / day) for nationwide staging and deployment. Total in-house services from full manufacturing to application development ensure all tracks of your project are expertly managed in parallel; saving time, money, and hassle. For an increasing number of customers, buying US manufactured goods is a key bid evaluation factor. 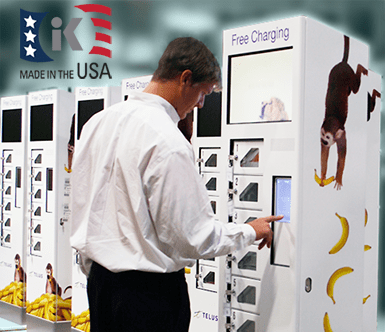 KIOSK utilizes metals and components (to the extent possible) which are manufactured / sourced in America. 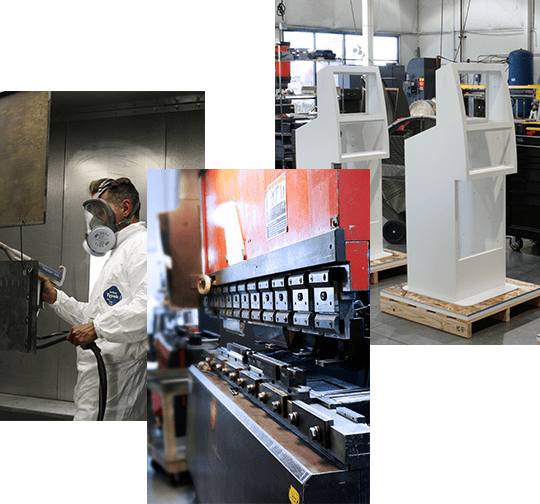 Design, manufacturing, integration, and factory support services come directly from our professional campus in Louisville, Colorado. Meaning, the same experts who manufacture your product, also domestically support it. Aside from better support and lower cost, US sourcing decisions directly impact domestic manufacturing jobs. And – yes, it does matter.